Based on events of the not-so-distant past, Pride is the story of how two wildly different groups could learn to come together and fight the power. 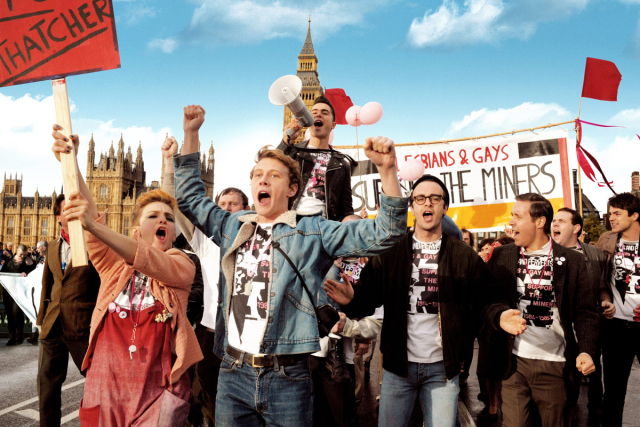 Set during the UK miners’ strike in 1984, the film depicts the formation of a lesbian and gay charity group aimed at supporting the families affected by the strike. Met with derision by the National Union of Mineworkers, the group Lesbians and Gays Support the Miners (LGSM) decided to direct their attention and funds to a tiny Welsh community. In the interest of full disclosure, we did not attend this film during TIFF 2014. We were however fortunate enough to receive tickets through one of Scene Creek’s wonderful contests. But as it did show at TIFF, and is still seeing a very limited release, we wanted to showcase Pride appropriately. The premise of this film is attention-grabbing even without the factual background. It’s hard to imagine two more disparate groups than big-city queer youth and weathered, grizzled miners. And yet in 1984 those two cultures met when the group Lesbians and Gays Support the Miners was formed. The logic was simple: both groups were on the receiving end of governmental oppression, police brutality, and national derision. The young lesbians and gays in London knew that their own community would sympathize with the starving mining families, and they were proven right with copious donations. The tricky part was getting the donations accepted. At first met with small-town closed mindedness and conservative backlash, they eventually made inroads with the miners and found a level of acceptance. Director Matthew Warchus plays the slow progress toward understanding and respect with a deft hand. He manages to humanize the bitter and fearful townsfolk, making it easier to sympathize with them despite their initial unwelcoming attitude. The cast was a jaw-dropper – both in terms of nuanced and ofttimes heartbreaking performance, but also for being a virtual Who’s Who of British actors. Bill Nighy, Imelda Staunton, and Andrew Scott were all pitch perfect, but my Chameleon award goes to Dominic West. They all came together, brought their characters to life, and managed not to overshadow the younger performers in the group. Pride is a coming out story. Literally in the case of a young man named Joe who gets swept up by the movement and introduces the audience to the 1980’s gay subculture; and figuratively in the case of the LGSM’s activities garnering national attention. It was a chapter of gay right’s history that I was sadly unaware of. Even in 2014 LGBTQ rights are still hard-fought, but looking back on how the generation before us had to struggle just to survive is an eye-opener. As a film study,watching The Imitation Game, Pride and finishing with Do I Sound Gay? would be an interesting exploration of the progress of gay rights and acceptance from the masses. I think Pride will quickly become a must-watch for LGBTQ youth, and hopefully for the “mainstream” public as well, to help spread the message of tolerance. Stacked with an all-star cast of British actors, Pride is a film that tells the story behind a little-known yet critical moment in LGBT history in Great Britain and shows how two very different groups fighting for a similar cause can find common ground that brings them together as a stronger whole. For many in the mining community, this was their first encounter with gay people in a time when they were still considered social deviants. As the miners began to see that the intentions of the LGSM were noble and genuine, the barrier of fear and uncertainty about these outsiders was gradually broken down and a sense of community was found. The support the gays and lesbians gave to the miners kept them motivated to continue fighting for their cause. In the end, when the moment came for the gay community to fight for theirs, miners across Great Britain returned the support, showing just how far the actions of a few reached in changing minds and society as a whole. This was a film I was eager to see. Aside from the uplifting, heart-warming nature of it, I was interested in learning about this important moment in LGBT history. The film depicts the times with honesty and, using laughter and humour to tackle the subject matter, it shows that even if you’re not part of either of these communities, there is universality to what is happening. At it’s heart, the film is about finding community and family where you least expect it and learning to stand up for yourself and the cause you believe in, all in an effort to not compromise who you are. Pride is the kind of film that refreshes the human spirit. It’s a joyous and crowd-pleasing journey that shows why, even still today, stories like this need to be told. This is a film that will leave you inspired and with a smile on your face. Pride is showing now in Toronto at Varsity Cinema. Don’t miss it! « Win tickets to The Delicious Food show!